Columbia River Maritime Museum. GPS: N 46, 11.37; W 123, 49.42. Go Northwest! photo by Jack High. RiverSea Gallery. 1160 Commercial Street, Astoria, OR 97103. Phone: 503-325-1270. 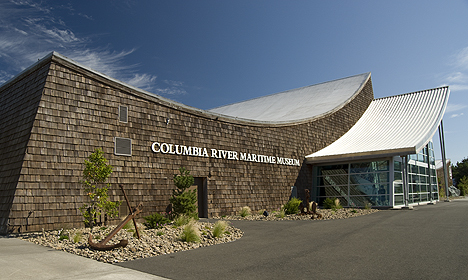 Columbia River Maritime Museum. 1792 Marine Drive, Astoria, OR 97103. Phone: 503-325-2323. Flavel House Museum. 441 8th Street, Astoria, OR 97103. Phone: 503-325-2203. Fort Astoria. 15th and Exchange Streets, Astoria, OR 97103. Heritage Museum. 1618 Exchange Street, Astoria, OR 97103. Phone: 503-325-2203. Overbay Museum and Antique Autos. 1233 Exchange Street, Astoria, OR 97103. Phone: 503-338-0042. Pacific Rim Gallery. 108 Tenth Street, Astoria, OR 97103. Phone: 503-325-5450. Uppertown Firefighters Museum. 2968 Marine Drive, Astoria, OR 97103. Siuslaw National Forest. Phone: 541-750-7000; Fax: 541-750-7234. Fort Clatsop National Memorial. 92343 Fort Clatsop Road, Astoria, OR 97103. Phone: 503-861-2471. Astor Street Opry Company. 129 West Bond Street, Astoria, OR 97103. Phone: 503-325-6104. Clatsop Community College Art Center Gallery. Lexington Avenue, Astoria, OR 97103. Phone: 541-325-0910. Astoria Column. 2199 Coxcomb Drive, Astoria, OR 97103. Phone: 503-325-2963. Located 1 mile south of Cannon Beach off the highway, Arcadia State Recreation Site is a wonderful place to spend the day at the beach. Here you can surf, watch tide pools or have a picnic. This beach stretches between 2 headlands, Humbug Point to the north and Lion Rock to the south. Low tide allows you to to pass both headlands. Bradley State Scenic Viewpoint. Phone: 503-861-3170 ext. 21; Toll-free: 1-800-551-6949. GPS: 46.170146,-123.435878. Bradley is one of the few rest stops along Highway 30 featuring a Douglas Fir forest overlooking the Columbia River, a monument and restroom. Liberty Theater. 1203 Commercial Street, Astoria, OR 97103. Phone: 503-338-4798. The River Theater. 230 W. Marine Drive, Astoria, OR 97103. Phone: 503-325-7487.